This was my third stay at the Fairview Guesthouse in 5 years. Truly a pleasure to stay here! Comfortable rooms, wonderful lounge, Jacuzzi tubs in some rooms. Miss it already! While our reservation was with Fairview, they moved us to their sister site, the Copper Kettle for some unknown reason. While they promised us a "room upgrade", the rooms were horrible. Extremely small and very noisy rooms. No lift, so prepare to haul you bags up the stairs. Very disappointing. Very nice hotel. Great location and comfy beds. Nice people at check in. Breakfast also good and the servers were very friendly. Would recommend. Perfect Irish hospitality. Individualized beautiful rooms. Perfect location near train station, town and park. Fabulous breakfast, both continental and made to order. Impeccably cared for. Prices are outstanding value. Ignore negative comments. We stayed for a month. We got to know the place well. It was our second visit. Comfortable and classic accommodations. The Fairview seems to be more of a hotel than a B&B. The focus is more on efficiency than it is on the relationship between innkeeper and guest that you might find in a smaller B&B. With that said, it very centrally and conveniently located. The rooms are comfortable, clean and well appointed. Beds are comfortable and plenty of linens are provided for your stay. Overall, it was a very positive experience. WE RECENTLY STAYED IN THE FAIRVIEW IN JANUARY IN A JUNIOR SUITE.THE ROOM WAS VERY WELL PRESENTED AS WE EXPECTED AS WE STAYED ABOUT A YEAR BEFORE THAT IN THEIR PENTHOUSE FOR FOUR NIGHTS WHICH WAS VERY PRIVATE & RELAXING.THE BREAKFAST IS GREAT & THE WHOLE EXPERIENCE FROM THE ENTERING TO LEAVING WE HAD NO PROBLEMS.I WOULD HAVE TO SAY THAT STAYING AT THE FRONT OF THE HOTEL CAN BE A BIT NOISY SO I WOULD RATHER BOOK A ROOM ONE OF THE SUITES AT THE REAR. BUT OVERALL ALL THE STAFF DO A GREAT JOB. We are regulars at the Fairview. It is always impeccably clean and well presented with beautiful decor and very comfortable furnishings. The breakfast is always freshly cooked no self service food warners here and settles beautifully. Great value for money within easy walking distance of the station and right in the centre of the town I can highly recommend this B & B. Stayed here last night in. The junior sweet .never again could hear everything outside throught the windows due to broken vents and one window would not close properly right hand side one .then a vent over the bed which was making noise all night did my head in .I also heard a couple complain next door about a ice machine on all night next to there room which were not impressed .its a gorgeous place inside and out but for 110 euros would not expect this as stayed mostly everywhere in killarnery over many years .my girlfriend told in reception no appology what so ever only said he had two more suites out the back free last night ..which was good to tell us the next morning than when checked in .I'm not one to complain but this just had my head done in and my girlfriend was not one bit impressed with her relaxing nite away coming up from Waterford. We were placed in a triple room with one twin, and one double bed. The room was right above the kitchen, and next to a hostel. It was very difficult to sleep because of the noise, and the lack of air moving through the room. When we asked for a fan, we were told those were for the "superior" rooms. Breakfast was a good value, and Tom gave us great service in the dining room. When leaving, we saw a room with 3 beds, and on the interior of the building. It would have been much quieter, but we were never told there was another triple room, and they were not available to book online. My experience was just acceptable. My advice would be to ask for an upgraded room. My wife and I along with her sister and brother-in-law had a wonderful 3-night stay at your lovely guesthouse. We were there 9/9 thru 9/11, and the stay could not have been nicer. Everything was top notch thanks in large part to the friendliness and helpfulness of Les, who seemed to do everything around there. He is a real treasure and someone you definitely want to keep around. Bravo! Excellent - it bills itself as a "guest house', but we would rate it as a 4 star hotel. Friendly, helpful and very efficient and profssional staff; rooms well-appointed, comfortable and spotlessly clean. Nice restaurant and excellent food. We recently stayed at The Fairview, and found it to be a lovely hotel! The rooms were beautifully furnished, the staff was extremely helpful, and breakfast was wonderful. The location is also excellent - right around the corner from the center of town. Killarney was an excellent location from which to see the southwestern corner of Ireland. Lovely atmosphere, brilliantly located in the centre of killarney town, top notch guesthouse. Easy to find from the train station. Nice room. Decent breakfast. Not a WOW, but certainly not a disappointment either. 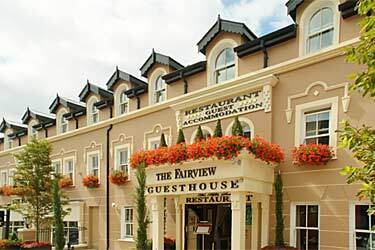 The Fairview was a great value and a surprisingly elegant accommodation . The restaurant service was impeccable and the food very good. I would recommend this b and b very highly. We were in Ireland for a month and this was one of the best places we stayed. Fairview GuestHouse, Killarney. Centrally located. Can walk everywhere. People very friendly. Good location but not quite a four star room. Breakfast service is excellent as is the staff. Everything was excellent. People were very warm and helpful. We will be back. We truly enjoyed our stay at the Fairview Guesthouse! The Family Room was lovely and the location suited us for our day trips to the Ring of Kerry, Dingle Peninsula, and days riding bikes and horses around the national park. What a beautiful town! The breakfast was a lovely start to each day with such perfect service. A standout staff person was the mature gentleman who manages the breakfast service... respectful, kind, and wonderful even with the children...perfection! This is a lovely, quiet guesthouse very centrally located in Killarney. It is very walkable to all locations in the downtown area. The only down side is parking off premises, but the lot is only about 1/2 block away. We rented a car and used this location for traveling to Dingle, Ring of Kerry and Beara Peninsula. The best accommodations that we stayed at during our trip. The Fairview exceeded all our expectations while visiting Killarney on a family vacation. We arrived after a tiring day of travelling and were offered upgraded rooms which we all thoroughly enjoyed. Breakfast was delicious and we were all treated like royalty. Great location. Fabuous staff. Always friendly, no mater how many questions asked of them! They set up a tour for us also. Room is spacious, large bathroom. Very beautiful, all the way around. Modern and comfortable rooms combined with an excellent location all at a reasonable price. Will definitely return when around Killarney. Very clean and spacious room. Excellent breakfast! The accommodations were very comfortable and the room was furnished with period antiques making it very attractive. We found the hotel staff very polite, helpful and accommodating. In particular the Head Waiter Tom was very professional and our breakfast time chats were always enlightening. The hotel itself was charming and our room was spacious and maintained daily to a high standard. We couldn't ask for more. Stayed at the Fairview early September 2012. Room, location and breakfast excellent. Close to everything, very helpful staff. Would definitely go back again. We enjoyed our stay and the location of the hotel. Breakfast was top notch with both light and full fare. Spent one day on rented bikes riding around the lake and castle, other daytrips with hotel as home base. The staff were polite and helpful - i would recommend this to anyone planning a trip to the SW region. We were upgraded, and although the room was a good size it was very noisy well into the early hours of the next morning. When I commented to the manager I felt my feedback was not appreciated. The breakfast was good. breakfast room is too small. Buffet is weak. The double bed mattress is old, thin and smells. DebiÃ³ de estar muy bien hace un tiempo. Ahora es normalucho. A nosotros nos colocaron en una habitaciÃ³n con unas preciosas vistas a un tejado, a menos de medio metro, habiendo reservado tres semanas antes.Ya no tienen restaurante aparece en Lonely Planet. Overall a very good hotel, location was excellent and room was clean. The breakfast was great. The room was lovely and accomodated our family of four. The only downside was that our room overlooked the patio in front of the hostel next door and was loud until 12 or 1 and then the garbage trucks came well before 7. If the windows are closed you would be fine. Lovely guesthouse right in the centre of the town, most convenient. Didn't have food there so can't comment but looks like a well-run establishment. Only niggle would be the poor WiFi signal upstairs and view from bedroom not great - back of hostel can't be helped!. Highly Recommended! The service and class of the Fairview Guesthouse was second to none! After a longer day of driving from Cork and around parts of the Ring of Kerry area, we were the last guests to arrive for the day. Although I could tell Anna was anxiously awaiting for us, she greeted us with such wamth and friendliness. Knowing that we would have trouble finding a kitchen that was still serving food at 9:00PM, she was helpful getting us checked in and up to our rooms quickly and hustled us off to a seafood restaurant down the street that she knew served food until 10:00PM. We had a lovely dinner there. She also let us leave our car in the set down area overnight because no one else would be checking in. Breakfast was perfect, as well. We loved the combination of a continental buffet to compliment hot options ordered from the menu. We could not be happier with the Fairview and would not hesitate staying there on a future trip to Ireland. The rooms are of a very hight standard and I love the jaquzzi after a long jouney. The choice and quality of breakfast is first class and better than many a 5 star hotel - nothing seems to be too much trouble. I am now a regular visitor to this guesthouse - what more could you ask.